The dance clubs that started mushrooming in the Russian capital in the 1990s are now as good as their London and New York counterparts. A key feature that attract tourists to Moscow is the city’s nightlife. Arma 17 is Moscow’s best techno club and the only Russian dance spot to have featured three times on the DJ Mag world’s top nightclubs list. Arma 17 stretches across the enormous territory of a decommissioned factory features a dance floor designed for 1,500 people. It has witnessed performances by almost all international techno music stars, including Ricardo Villalobos, Sven Vath, Ellen Allien and Guy Gerber. A visit is a must for all fans of techno and huge underground raves. Concert and party tickets cost $16 and a beer starts at $4. The Darling I'll Call You Later chain consists of three Moscow bars that combine rock-n-roll, delicious beer at $6 and a home-like atmosphere. Here you can enjoy a tasty breakfast or lunch while watching a cinema masterpiece or a music show. In the evening, major sports events are broadcast and football tables are installed for those willing to play. On Fridays and Saturdays, the bars throw parties, where famous TV presenters, editors-in-chief of glamour magazines and next-door music fans can all spin the turntables. A typical lunch here costs $20. Kamchatka is a city centre pub in a prime location right in front of the city’s most luxurious department store, TSUM (the local version of London’s Selfridges or Milan’s Rinoscente). This two-storey bar, meticulously decorated in Soviet style, is a must-see for any foreigner interested in the drinking and eating habits of Communist Russia: Kamchatka’s menu complements its interior quite harmoniously. 1980s and 1990s Soviet pop songs are played non-stop and the prices are quite affordable. The house specialty beer is called Kamchatka and costs $3. Propaganda has been an urban landmark for the last 16 years. This nightclub is the longest-lived of Moscow’s disco spots and is particularly favoured by Moscow expats. Main events take place every Thursday night, when DJ Sanches puts on his techno set for the coolest clubbers in town. The dance floor is open to visitors daily: hip-hop and soul parties are held on Mondays and Tuesdays, while the rest of the week is dedicated to quality dance music, mostly techno and tech/deep house. On Sundays, the club hosts the best gay parties in Moscow. During the day, Propaganda operates as a restaurant renowned for its low prices and delicious food. The Caesar salad ($5) served here is rightfully considered the best in the city. Sixteen Tons is another veteran of the Moscow nightlife scene. The first floor of the building is occupied by a pub and a restaurant, whereas the second is reserved for parties and music shows. 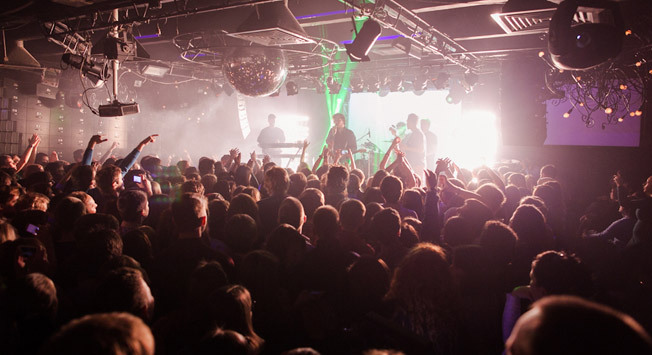 As one of the best music venues in Moscow, it regularly hosts gigs by local musicians, as well as the likes of Mogwai, Crystal Castles, Husky Rescue and other international stars. Concerts are often followed by parties of the most diverse types, ranging from transvestite freak shows to dubstep and underground hip-hop jams. For $5 you can enjoy a glass of Sixteen Tons' signature beer. Solyanka is widely believed to be Moscow’s central nightclub. The place is often called a “hipster stronghold” but this is not the case, if you know which party is right for you – and the choice here is enormous. Solyanka is located in an antique mansion in the centre of Moscow. To enter the club, one has to climb up a marble spiral staircase leading to the first floor, which mostly resembles a three-unit Moscow apartment of the Russian Empire era. It largely owes this impression to the cosy interior and vintage leather armchairs. The dance floor is the last of the rooms and also the most spacious. Parties are held from Thursday to Saturday (and sometimes on Sundays, too) and the music ranges from techno and house to funk and hip-hop. The club also hosts interesting guest performances on a weekly basis. Special mention should be given to the Love Boat party run by famous fashion blogger Vitaly Kozak. During the day, Solyanka transforms into a trendy and quite affordable restaurant. Lunch here costs about $13 to $16 and a beer goes for $4 to $13. Krasny Oktyabr, a “city within the city,” has been a key Moscow landmark for the last few years. This arts district located in the very heart of Moscow owes its name to the former chocolate factory it now occupies. Krasny Oktyabr represents the quintessence of bohemian Moscow, with trendy nightclubs, bars, restaurants, art galleries and exhibition halls. No matter where you come from, the place is definitely worth a visit. We would recommend setting aside at least half a day, ideally starting around 5 p.m. and lasting until the morning. As mentioned above, Krasny Oktyabr features a number of cool places but, for the time being, we will focus on only three of them. Thanks to its big summer terrace with a picturesque view of the Moscow River, Gipsy remains one of the most popular party locations in summertime Krasny Oktyabr. Not that it is any less fun in the wintertime: a big indoor dance floor with a bar in the middle, disco balls hanging from the ceiling and walls upholstered in fake cheetah skins help sustain the party atmosphere. The Gipsy’s public is rather pleasant and includes plenty of gorgeous girls. Some of the city’s best techno jams take place here on Fridays, while Saturdays are reserved for mash-up and alco-dance music. During the day, Gipsy transforms into a good restaurant, which we highly recommend visiting in summer for lunch on the terrace. The meal will cost you $13; a Mojito is sold for $8. Perhaps the best alco-dance spot in the city and Krasny Oktyabr. It is always jam-packed, noisy and very entertaining. The dance floor is dominated by a mash-up of British rock and old hits. Just like Gipsy, Rolling Stone boasts a spacious terrace, which is open throughout the summer and the winter, and beautiful scenery. One of the locations most favoured by Moscow expats. The prices of shots range from $4 to $9. 3 unit 1, Bolotnaya Nab. Strelka Bar has been Krasny Oktyabr’s centre of gravity since it opened. Its prime location and special ambience attract the hippest folks in town. In summer, the bar opens a rooftop terrace, which has a mesmerising view of the Moscow River. Concerts and dance parties are held regularly in the evenings. Cocktails cost about $13 and the starting price for wine is $9. 14 unit 5A, Bersenevskaya Nab. Editor's note: please check the updated list of Moscow's best bars and nightclubs in 2015 here.